Ernest A. Batchelder was the founder of the Batchelder Tile Company, a firm whose Arts and Crafts-inspired tiles ushered in the golden age of California tile making. His distinctive design aesthetic influenced numerous other tilemakers and artists. 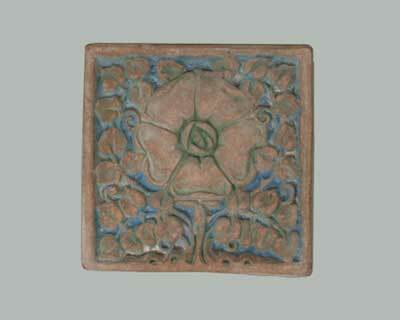 Today, Batchelder tiles can be found in homes, civic and commercial buildings, and gardens across the country. Ernest A. Batchelder was born January 22, 1875 in New Hampshire to a family of bricklayers and carpenters. He trained as an art and design teacher at the Massachusetts Normal Art School in Boston, graduating in 1899. His ideas of design were heavily influenced by those of Harvard design theorist, Denman Ross, for whom he briefly worked. Much of Batchelder’s subsequent fame as a tilemaker has overlooked the fact that first and foremost, he was an educator. In 1902, Batchelder began teaching design and drawing at Throop Polytechnic Institute, the prestigious Pasadena-based school that combined liberal arts and sciences with manual training. About this important concept, Batchelder wrote, “In the co-operation of these two we hope eventually to find a knothole through which we may creep into the field of commercial work and make industrial art a vital factor in production.” By 1906 he was appointed Director of Art at Throop. An ambitious and energetic man, Batchelder continued to advance his career in other ways. His articles about design appeared in installments in Craftsman Magazine and The Inland Printer, and were later turned into books. He received a bronze medal for his work selecting Southwestern Indian artifacts for the Louisiana Purchase Exposition of 1904. From 1905 to 1909, he headed up the Minneapolis Summer School of Design, a position in which he came into contact with many of the country’s leading Arts & Crafts artisans. In 1905, Batchelder took his first trip to Europe, where he toured the Continent, then studied at Ashbee’s Guild of Handicraft at Chipping-Campden in the Cotswolds and the Central School of Arts and Crafts in Birmingham. This thorough grounding in the Arts and Crafts principles influenced all of Batchelder’s work. 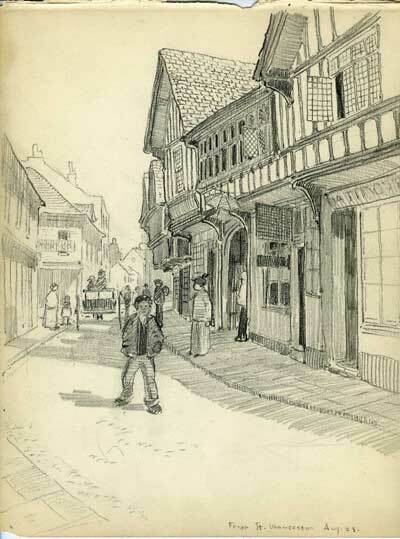 The sketch shown was drawn during Batchelder's European travels when he took a leave of absence from his job as a design instructor at Throop Polytechnic Institute in Pasadena. 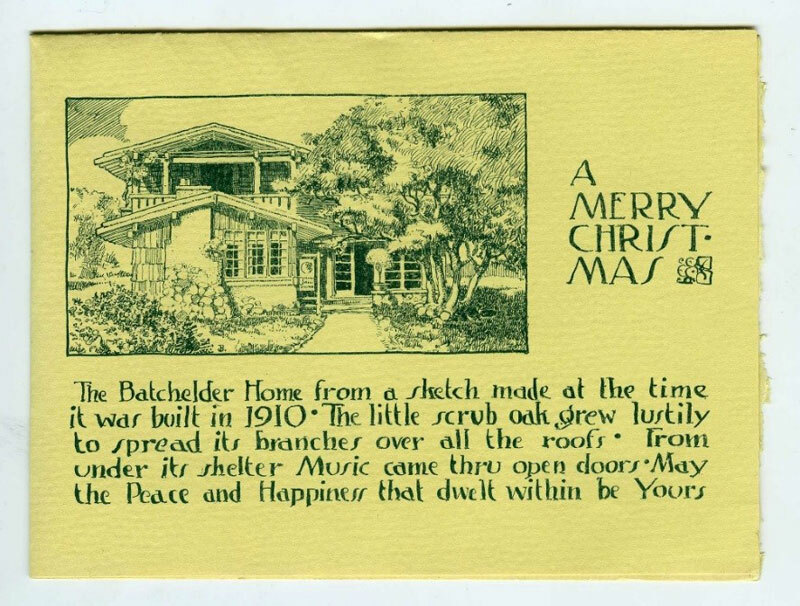 In 1909, Batchelder purchased a plot of land on the banks of Pasadena’s Arroyo Seco. He had a modest two-bedroom bungalow constructed to his own design, with a studio in the back garden. He immediately announced plans to form a “School of Design and Handicraft,” which formally opened in February 1910 with a display of work by the teachers of the school. Batchelder recruited a diverse group of artisans to teach embroidery, pottery, jewelry-making, metalwork, and more. Although his school lasted less than a year, the teachers all stayed in the area and, for the most part, went on to careers of renown both as artists and educators. Batchelder’s influence on the next generation of artists, designers, and educators is an important legacy. In 1912, the firm was incorporated as Batchelder & Brown, Inc. 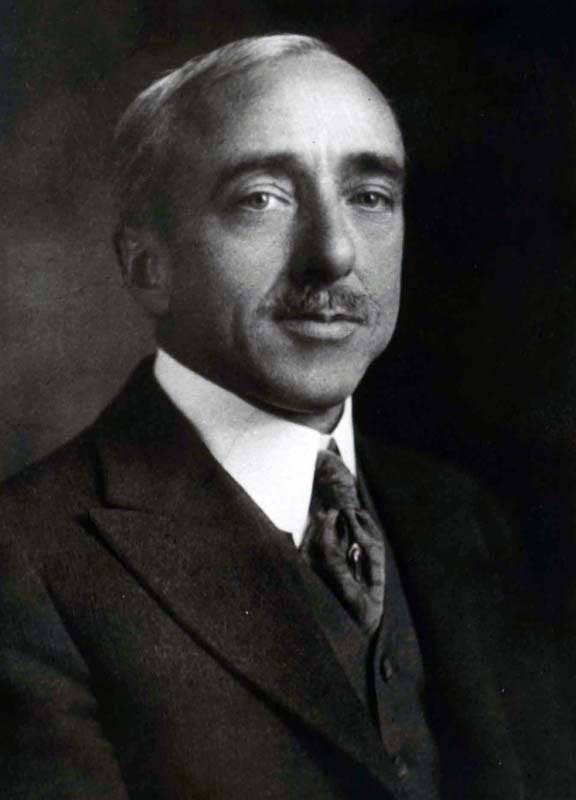 In addition to Frederick L. Brown and his son, the other investors were local banker Holloway Stuart and Procter & Gamble heir, David B. Gamble, each of whom put up $100. The new firm secured larger premises at 769 South Broadway (now Arroyo Parkway). Their first catalog, which was issued in 1912, contained a wide range of tile designs, from biblical to medieval to Renaissance to Art Nouveau, many based on the illustrations in Batchelder’s books. As the catalog explained, the tiles were “hand wrought, by processes peculiar to our own factory.” After a paper design for a tile was drawn and reproduced in clay, a key or master mold was made. From the key mold, plaster production molds were made. In the early years, clay was hand-pressed into the molds, then air-dried before firing. The distinctive muted colors of the tiles, with a soft engobe or matte finish, were compared to a Persian rug, “which do not admit of positively inharmonious combinations.” This understated look was appropriate for Craftsman architecture. The tile clay body is an encaustic, non-vitreous material; the surface color is a mineral slip fired into the surface of the tile in such a way that it becomes an integral part of the clay body, presenting a surface texture free from gloss and with the mottled surface characteristic of a Batchelder tile. Other terms that might be used to describe Batchelder’s tile surfaces include matte, semi-matte, opaque, engobe, slip, or slip glaze. 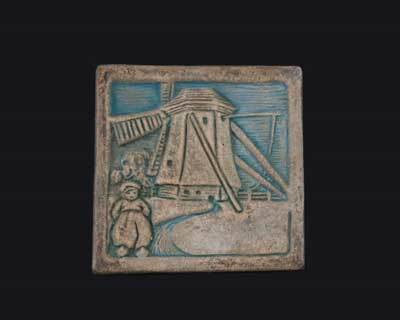 The distinctive look of Batchelder tiles soon became popular, and the young company outgrew the backyard kiln. Ernest Batchelder: Educator, Designer and Tilemaker: Part II was posted on October 25.